Ottoman beds are built with storage space in mind but they've got to look the part as well. Thankfully they're available in a huge range of styles and colours, with ottoman frames being made from wood plus upholstered in various fabrics or faux leather. Wooden ottoman beds provide a traditional feel which benefits from the beauty of natural wood grain, finished with suitable stains to complete the look. With this in mind, you can opt for something which compliments your bedside tables and wardrobes etc. Upholstered ottoman beds provide a more contemporary feel. Dark faux leather fabrics give a sense of sleekness, whereas lighter colours such as white or cream allow natural light to be reflected much more efficiently, giving a sense of space. Fabric choices give a softer and more welcoming message, which can easily be accentuated by soft furnishings and complimentary drapes. Furthermore, there is another option to consider as well. Divan style ottoman beds include the solid fabric bases that divan beds have. This can be an ideal solution if space is limited. This is because divan bases sit flush with the mattress along the edges and no extra space needs to be taken into account on the length and width to ensure a decent fit. 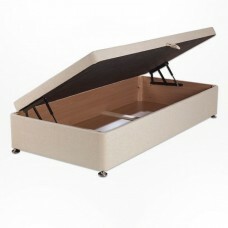 The Ottoman side opening storage divan bed has a gas lift mechanism which makes it extremely easy to.. The Ottoman end opening storage divan bed has a gas lift mechanism which makes it extremely easy to ..